The V5 Robot Battery is designed to work together with the V5 Robot Brain and Smart Motor(s) to power a consistent and reliable performance, even when the battery charge is low. 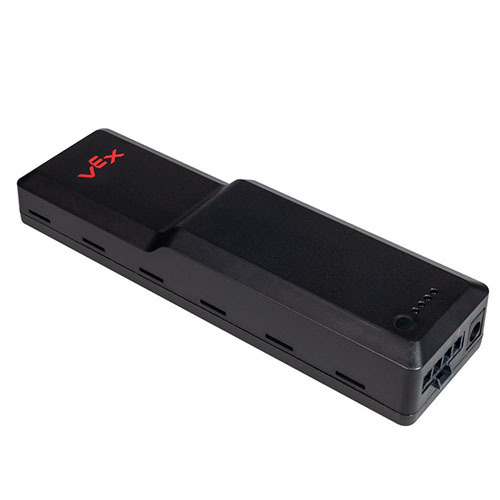 The V5 Robot Battery (Li-Ion 1100mAh) was designed to maximize motor performance. The battery has enough power to run ten V5 Smart Motors at full power continuously. 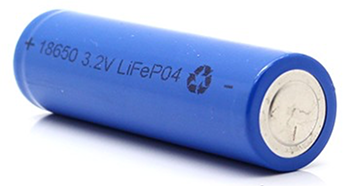 VEX chose a lithium iron phosphate battery chemistry (LiFePO4) because it has four times the lifespan of the more traditional nickel metal hydride (NiMH) battery chemistry. This lithium iron phosphate chemistry also has greater stability and is safer in multi-cell packs, especially when used to provide high currents. The V5 Robot Battery has a very steady output voltage but the compromise was that the V5 Robot Brain would need to estimate the battery's remaining capacity in a way that is nontraditional. The first step in this new process was to have the V5 Robot Battery measure changes in electrical charge (coulombs) into and out of the battery during charge and discharge. Then, the intelligent battery management system uses that data to calculate the actual amount of remaining power. The run-time on a fully charged battery depends on your robot's design, your driving, and the number of motors used. Robots often get 30+ minutes of heavy drive time from a single charge. Competition teams should be able to use one V5 Robot Battery for multiple matches without recharging. The management system also handles cell balancing and charging. Cell balancing is used to ensure that each cell in the pack is at the exact same voltage, a critical factor in maintaining battery pack performance. Charge time is approximately 60 minutes. The V5 Robot Battery is designed to be both safer and more powerful. The lithium iron phosphate chemistry means that the V5 Robot Battery will last four times as long as the 7.2V Robot Battery of the Cortex. Whereas the approximate lifespan of the 7.2V Robot Battery was 500 full recharge cycles, the lifespan of the V5 Robot Battery is 2000 full recharge cycles. While the 7.2V Robot Battery could power up to five motors at peak power with a power expander, the V5 Robot Battery can power 10 motors even without an expander. This allows for more advanced robot designs. The V5 Robot Battery consistently powers the motors at 100% power even during low battery conditions whereas the 7.2V Robot Battery would drop to 51% power during low battery conditions. Full battery power is important for reliably consistent performances of the motors, especially in competition settings. The V5 Robot Battery can be used while it is charging. This is an important, user-requested improvement over the Cortex system which sometimes frustrated users as they waited for batteries to charge before they could run trials with their robots.